Sometimes Nathan and I hit a point of being stuck on an issue. We listen to each other, try talking it out for a good while, and still find that neither of us can budge from our stance. Stuck is when I hear his words but they don’t change my thinking at all. I’m not feeling them. I so hate it when we are not on the same page. When I get stuck, I have some choices. It did happen, and that wall that the two of us hit is gonna stay right there. The more walls we build up, the farther the distance between us. Each tiny place where we make the choice to be okay staying stuck will keep us from having the muscle to work through the “stuck” on big issues. I wish I had a fool-proof answer. I don’t. But I can tell you some things that have helped me. 1. Refuse to stay stuck. Recognize that you are stuck, and refuse to be okay with that. It may take hours, days or weeks to understand each other, but decide that it will be worth it. 2. Make extra time to navigate the stuck. These aren’t conversations you want to have lingering around the dinner table or in the 5 minutes between two errands. It will take work that won’t be fun. But make the time. 3. Continue showing the love. Being stuck can make me feel mad at him and mad at me. I don’t wanna deal with it. But as long as we are still devoting time to work on the issue, we can continue to have fun together and love each other well in all the other areas. We don’t have to put all the other good stuff on hold while we navigate this. In our most recent case, we asked another couple. They mostly just listened, asked questions that guided our discussions and then carefully offered us a few suggestions and feedback. It definitely helped us navigate things better. If you work at it but you are still stuck, you could always work through it with a professional. One thing I know for sure: Getting unstuck will be worth it in the end. Do the work and don’t settle. How do you decide whether or not to throw in the towel when a situation feels hopeless? That week as I was struggling, I opened a new book that I didn’t know much about. The book was Looking for Lovely. 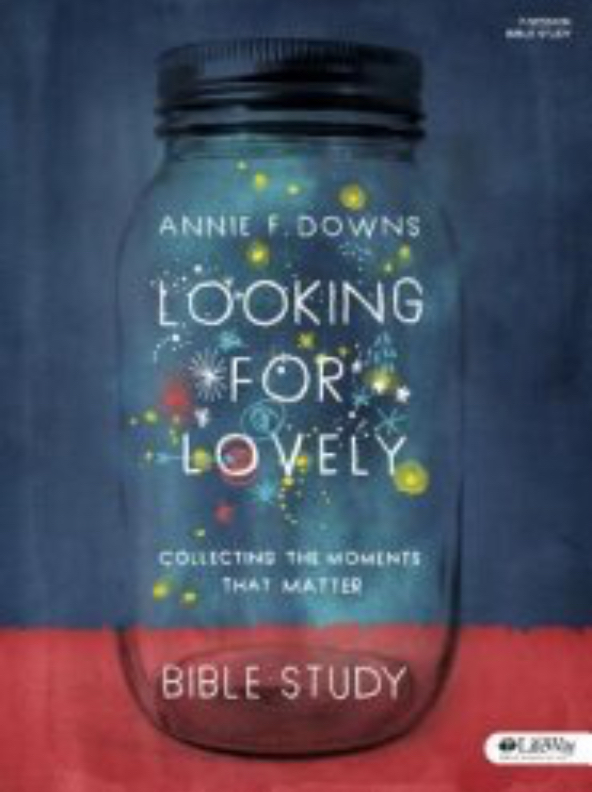 I did the book study with friends, and it was admittedly chosen a lot for the fact that it has a beautiful cover. See? The first paragraph was about persevering and not quitting. It’s actually what the whole entire book is about that I would study almost daily over the next six weeks. Every day as I filled in the blanks and read the verses, I was reminded of why we persevere, how it develops character and how we can remain hopeful. There is no doubt in my mind that these weeks were chosen by God for me to be focusing on this concept. Sometimes we can find peace in quitting something as God releases us from one thing and into another. But in this season, God tells me not to quit. Don’t quit just because it’s hard. Don’t quit just because there are dark days. Persevere because of the character it builds and the hope that is coming. Set a wide and generous table. I’ve been thinking a lot about simple hospitality, the good things that happen around a table and making yourself more vulnerable to others. I live in a modest log cabin in the woods by a pond. We live a beautifully simple life without a lot of bells and whistles. Our home is never going to be featured in Southern Living. But there are things that can make my home a wonderful space for people. I think Jesus shared a meal around the table with all kinds of people and just made room for them without asking questions. I bet it was simple instead of fancy, but that the company is what mattered the most. I recently felt prompted to make some space in my life. And then I quickly thought of people I could invite into that space. But would I do it? Scary stuff to invite people in. To invite people that you hardly know. I mean, all the thoughts. Will this conversation be awkward? Will a “no” feel like rejection? Will they think I’m desperate for friends? The bottom line is that you have to decide that it doesn’t matter. Be okay with possibly looking like a crazy person. Certainly be okay with a no, because you’ll get a lot of those. Whatever happens will be okay and the risk of doing this thing will be worth it. And so I said yes. For me, it meant hard work to clear out a space for those God wanted to bring. And yes, I mean like even physical hard work. Cleaning up my home beyond what is just normally needed to create space for people and an environment for a group. Getting out the extra chairs. Putting away the cluttery art projects. It meant cleaning off and cleaning up my back yard. It’s paying attention to small details that create spaces for conversation and connection. Making it look like you are expecting people to sit and linger in a conversation. And as I spent the time on these tasks, I found that they are physical representations of what was mostly happening in my heart. That’s the hardest work of all. I’m cleaning up in there. Like my back yard, junk just seems to show up there that I don’t want. I’ve got to get rid of some junk to make space for people. To make space to love people. And how cool is it to have friends who jumped in it with me? They did the physical hard work with me of clean up. They helped me sort through and process my emotional junk too. And then our tribe showed up to welcome new people with us to the point that my load in the end was very little. So here’s what I’m going to do. Keep making room for people. Keep having open seats at the table. Try to keep things more cleaned up and welcoming on the outside, but also on the inside of me. Sometimes it won’t be the easiest way or the most comfortable way. But there’s something rich that happens if you’re willing.